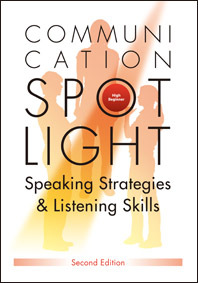 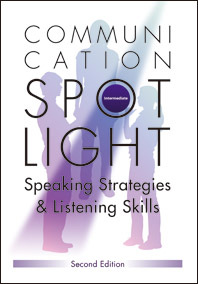 Spotlight on Speaking: focuses on the strategies of speaking—the strategies that work to give students control in communicative situations, to confirm or clarify what they’re saying and what they’re hearing, to show interest in and to maintain and develop conversations, to help with fluency and to compensate for a lack of language. Knowing and using strategies can give immediate benefit and is highly motivating. Spotlight on Listening: shows students how English is actually spoken, helps students move beyond classroom English to the English of the real world. Spotlight on Memory: has students focus on form from hearing alone, stretching short term memory—vital for listening comprehension.